I’m not sad at all that the fall/winter season is upon us, not only because it’s still in the high 60s/low 70s here in Ukiah, but because we’re flooded with squash. I’ve been buying it in bulk at the farmer’s market to store in our chilly back room, where it should keep for several months. I also harvested the seven “zebra” pumpkins we managed to grow from one plant at our community plot (which was somewhat neglected this summer). I. love. squash. It’s so simple to cut one up and throw in the roasting pan with whatever protein we’re having, especially thin-skinned varieties like Delicata, whose skin is edible and tasty. Squash is sweet and filling and healthy. It tastes good with every single spice combination I’ve ever tried. Also, it’s relatively cheap. Yesterday I processed four 5-lb pumpkins by roasting and blending them. I also separated out all the seeds which can be time-consuming because of the pesky flesh that clings to them, but totally worth it when you’re popping the crispy end-result in your mouth. I froze about 2 quarts of plain pumpkin to be used for pies and probably a soup down the line, and I also made 2 quarts of a truly fantastic soup, one of which we ate for dinner and the other we put in the freezer for an easy dinner down the line. I adapted it roughly from this recipe, but instead of chicken broth I used the drippings and leftover gravy from a chicken I roasted on Sunday night. I also added shredded chicken from the same bird, and left out the maple syrup since I had blended in some roasted apples as well. If you make this, do not skip the fish sauce! I also used lemon instead of lime (our Meyer lemon tree is finally producing beautiful yellow fruit!) but honestly, you could skip it entirely. I LOVE citrus but there are enough complex flavors in this soup without it. 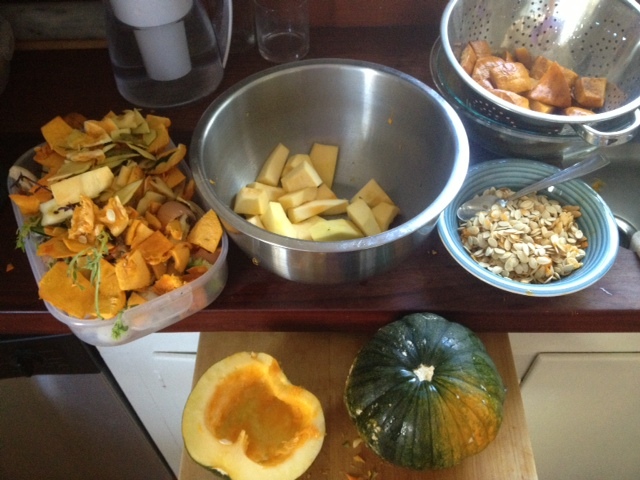 The many stages of processing: compost; raw cubed pumpkin; whole pumpkin; seeds; and the end-result cooling in a colander.